UFF-FSU – FSU Works Because We Do! Find out what this union is all about. 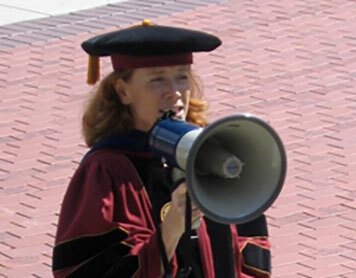 We've been working for over four decades to champion faculty, students, and higher education at FSU. We are extremely proud of our history. It inspires us to keep working for a better future. Our union can't function without you. Help us defend your rights, defend your colleagues, and defend the principles of higher education against the policies that threaten our institution. Your UFF-FSU Bargaining Team discussing our contract at the statewide UFF meeting. There are many benefits to UFF membership. Make sure you're taking advantage of all we have to offer. Your membership dues could pay for themselves! There are so many ways to give back to the union that works for you. We need the support and dedication of our members to keep running. Find out what's right for you. UFF-FSU is here to help our members through their problems. If you're not sure how to resolve an issue with your department, take advantage of our collective experience. 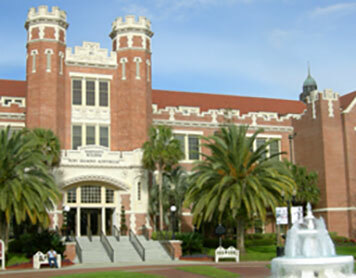 We are the United Faculty of Florida chapter for Florida State University, the labor union representing faculty at FSU. Since our founding in 1976, we have worked tirelessly to improve the working conditions for our members across campus. We are only as strong as our members. Please consider joining today or getting more involved in the union that fights for you! The poll results, versions with and without comments, are available as PDFs below. The finalized minutes from the September consultation are available below. 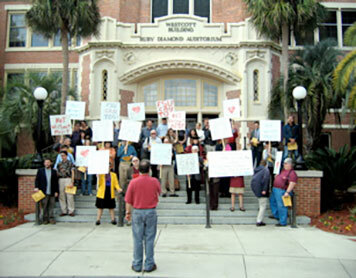 UFF-FSU seeks testimonials from members to share on its website and through other media. Why are you a member? How has membership been valuable to you? If you have a testimonial you’d like to share, you may submit it through this online form. The finalized minutes from the May consultation are available below. The Notice of Ratification Vote and Meeting, including voting locations and times, is available here: Notice of Ratification Vote and Meeting May 2018.